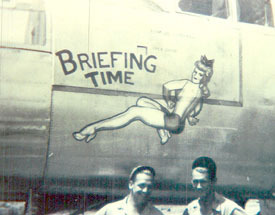 Panel size: 18.5" x 40"
While serving with the 489th, Briefing Time completed 126 missions from 16 May 1944 - 26 April 1945. This a/c shares credit for sinking the Italian cruiser Taranto. 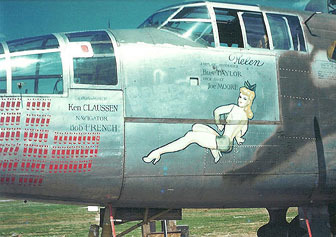 This panel's nose art is also on a B-25 operated by the Mid-Atlantic Air Museum (MAAM) in the airshow circuit today although its colors are not as accurate. In the original rare color photo above, it seems that the name has been removed. There was another B-25 in the same squadron named Quitting Time with the same Varga girl suggesting that 43-27638 had the name removed. In the other photo above, the OD green top camo has not yet been applied. In any case, the a/c was natural metal as opposed to the restored a/c at MAAM.